1. University of Minnesota, Minneapolis, MN, USA.2. DiagnosTechs, Kent, WA, USA.3. Institute of HeartMath, Boulder Creek, CA, USA.4. National Institute of Child Health and Human Development, Bethesda, MD, USA. Adrenocortical desynchronization, usually asymptomatic, led to the "circa" in "circadian" (1); 60 years later, a set of frequency-desynchronized variables are associated, with a twice-yearly, recurrent twoor more-month-long adynamia, in a 62¬year-old woman, JF, sensitive to helio-geomagnetics and the moon phase, as reportedly are her daughter FT and granddaughter LT. Global (monthly) extended cosinors examine whether the ordering CI (95% confidence intervals) of the periods, fs, in vigor, the circulation and salivary steroid hormones overlap 24.00 or 24.84 hours (h) or neither, while local serial sections determine, in weekly summaries, the times of desynchronization from and resynchronization to 24.0h (glocally). Two adynamic episodes each started with a lunar cycle characterized by a double circatidal f in vigor, objectively validating JF’s claimed lunar sensitivity, as does her water retention at the new moons (cf. 2). Her, but not FT’s, novel blood pressure (BP) and heart rate (HR) variability anomaly involves the alternation of months with; 1) a f of 24h and 2) a f longer than 24h and shorter than the lunar 24.8h. 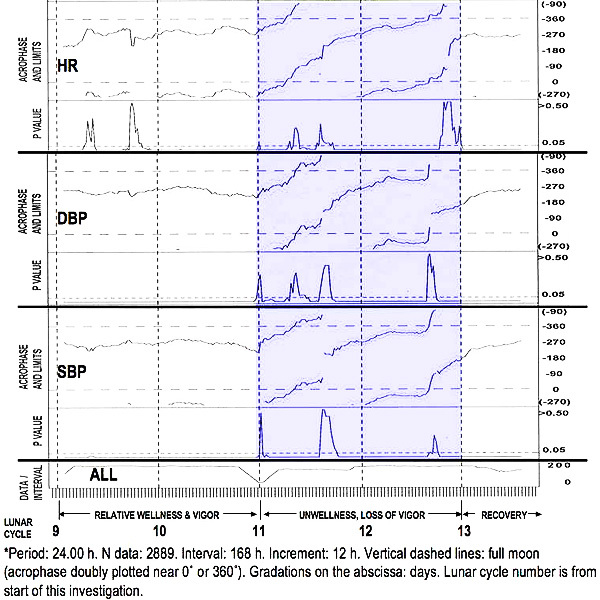 In JF, Figure 1, JF’s HR (top 2 rows) and diastolic and systolic BP (middle 2 and bottom 2 rows) are synchronized with the societal 24h schedule, as shown by a more or less horizontal time course of acrophase in lunar cycles 9 and 10. In cycles 11 and 12, the oblique delaying time course of acrophases is in keeping with a f longer than 24h. During only 41 days of desynchronization in a winter adynamia, the fs for HR, diastolic and systolic BP were of 24.36, 24.63 and 24.55h length, respectively, with CIs overlapping neither 24.00h nor 24.84h. A neuroendocrine interaction with the physical environment accompanies (contributes to) a severe twice-yearly adynamia (possibly a beat cycle of cortisol and an unknown factor underlying the vigor’s f (melatonin?). LT shares a yet-to-be-validated (on records longer than now available) cis-halfyear in well-being with JF but not (yet?) with FT, perhaps in keeping with the possibility of a familial disorder. Vascular variability disorders, previously diagnosed by model-fitting, included the alteration of the average (MESOR-hyper-and hypotension), amplitude (circadian hyper-amplitude-tension, CHAT) or phase (ecphasia) of a 24h cosine and, rarely in societal life, of the in-itself harmless change of the circadian period; f-alteration becomes symptomatic when it interacts (beats?) with probably seleno-geomagnetic factors. By elucidating and acting on mechanisms (feedsidewards) underlying frequency desynchronization, adynamia may be prevented. A better understanding of underlying mechanisms uniquely possible from JF’s data, together with lessons learned about unseen (gravitational and/or magnetic) influences on societal diseases, e.g., terrorism incidence characterized by nonphotic, possibly magnetic cycles, may eventually serve for the development of countermeasures. The authors are indebted to Jon Clark of Spacelabs (Issaquah, WA) for the instrumentation used. Halberg Franz, Cornélissen G, Katinas G, Syutkina EV, Sothern RB, Zaslavskaya R, Halberg Francine, Watanabe Y, Schwartzkopff O, Otsuka K, Tarquini R, Perfetto P, Siegelova J. Transdisciplinary unifying implications of circadian findings in the 1950s. J Circadian Rhythms 2003; 1: 2. 61 pp. www.jcircadianrhythms.com/content/pdf/1740-3391-2-3.pdf. Payne SR, Dearden DJ, Abercrombie GF, Carlson GL. Urinary retention and the lunisolar cycle: is it a lunatic phenomenon? BMJ 1989; 299: 1560-1562. 24-hour Synchronization of Circadian Vascular System of JF, F, 62 years of age, in first 2 lunar cycles followed by desynchronization from societal schedule, with possible pull by lunar tides in subsequent lunar cycle(s) seen in partial chronobiologic serial sections for comparisons of spans before (lunar cycles 9 & 10) and during unewllness and loss of vigor (lunar cycles 11 & 12), and (a trend toward) resynchronization in lunar cycle 13, immediately for heart rate (row 1), more slowly for diastolic blood pressure (DBP, row 3) and not yet for systolic blood pressure (SBP, row 5).